Christmas season is upon us, and that means one thing — it’s time to start thinking of wonderful gifts for your friends and family! At this time of the year, everyone is scrambling over themselves to catch the best Black Friday steals. 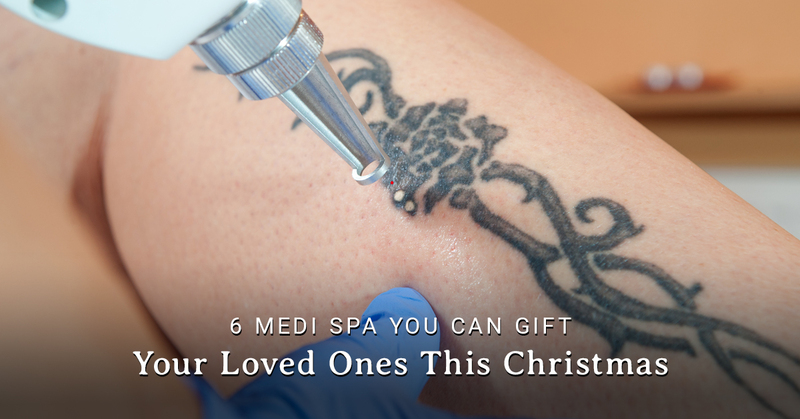 Why don’t you save yourself the trouble and consider getting your loved ones some Medi-Spa services instead? There are plenty of services we offer that would make for perfect Christmas gifts. While a trip to a medical spa isn’t a present that one can unwrap and open, it will be a refreshing, transformative experience that will leave the giftee feeling rejuvenated. Let’s face the truth — if we could all be bronze goddesses every day of our lives, we would. Unfortunately, winters in Maryland aren’t very forgiving, and it’s not exactly a viable option to lay outside in a bikini when we’re ankle-deep in fresh snow. That’s why it’s a great idea to treat your friend or loved one to a spray tanning treatment! In just 20 minutes, you can go from looking like a pale ghost to someone who just came home from a Hawaii vacation. Our spray tanning services look natural, while also avoiding the dangers that come with spray tans or natural tanning. By baking yourself under the sun or in a claustrophobic tanning bed, you expose yourself to ultraviolet rays, which don’t play well with your skin in the long run. Do you have a friend in Prince Frederick or La Plata who wishes they could do something about their pale skin? Take them into Rejuvenation Medi-Spa for our spray tanning services! Do you have a friend, relative, or loved one who is just sick of that one tattoo they got five years ago? If you know beyond a shadow of a doubt that they want nothing more than to get rid of it, why not offering to pay for a trip to our medical spa for tattoo removal services? As it turns out, fall and winter is a great time for tattoo removal services, and you can give the gift of getting the process started! At Rejuvenation Medi-Spa, we offer PicoSure® laser removal, the latest and greatest in tattoo removal technology. This innovative method is highly efficient, and it reduces the overall number of appointments you have to make compared to other types of treatment. We don’t recommend this as a gift if the recipient has never once complained about their tattoo (passive aggressive, much? ), but if you know for a fact that they’re looking at removal options, there’s no better place in Maryland to get the job done than Rejuvenation! Everybody wants to look young forever. While we haven’t yet found the Fountain of Youth, botox treatment is one of the next best things. Botox injection is a fast, safe, and effective way to reduce the appearance of wrinkles. Everybody needs a “beauty friend,” with whom they can have fun trying all kinds of methods to keep themselves young and beautiful. A great Christmas gift could be a trip to a medical spa together for Botox treatment. But before you go, make sure you’re aware of the common misconceptions about Botox, and what not to do after treatment! And, as always, we encourage you to contact us at our La Plata medical spa if you have any questions about the process. Facial treatments are not only highly beneficial for your face and skin, they’re also incredibly relaxing and therapeutic experiences which will have you feeling born anew when you walk out of our medical spa. With that being said, what could make for a more perfect gift for your loved one? Treating a friend to a facial treatment is a great gift idea because it’s a one-time treatment which leaves you feeling amazing. Not only that, but we offer a variety of different facial treatments, allowing the giftee to choose something that’s perfectly suited for them. We offer Acne Facials for your friend who suffers from breakouts, Anti-Aging Facials for those who want to look and feel young, Fire and Ice Facials for someone who wants intense complexion perfection, and many more. Our European Facials are one of our most popular services. Treat a loved one to a facial treatment of their choice this Christmas! Did you know that your skin accumulates a top layer of dead skin cells which regenerates about every 30 days? These dead skin cells reduce the overall smoothness of your skin and can block your pores, even if they’re microscopic. Microdermabrasion is a treatment which eliminates this top layer of skin, exfoliating it, eliminating aging spots, and reducing the size of your pores. This cosmetic treatment is non-invasive and has little to no side effects. But the best part of microdermabrasion is how amazing and refreshing it feels to have your skin completely rejuvenated! A lot of customers that come to us for microdermabrasion services are first-timers, and we love seeing the look on their faces as they walk out. Treat your friend or loved one to this wonderful sensation at our Prince Frederick Medical Spa! One thing that a lot of people forget about medical spas and day spas is that they not only offer amazing beauty services, they also offer the highest quality products in the world of skin care. At least, that’s true for our spa, and it goes without saying that these products could make for excellent Christmas gifts to anyone who is invested in taking care of your skin. We’re happy to provide products from PCA Skin, Zo Skin Health, RevitaLash, Glo Minerals, and Crystal Peel. Each of these brands provides a plethora of amazing home care solutions that will allow you to give your skin the care it deserves on a day-to-day basis. This is a gift that you can pack in a box and bow, so it’s perfect for Christmas day. Alternatively, these products could work as great stocking stuffers. Stop by our Maryland medical spa today and shop our professional skin care products! While we’ve pointed out some fantastic Christmas gifts you could treat a friend to, we’ve only scraped the surface of the wide variety of beauty spa services that we offer at Rejuvenation MedSpa. Whether you’re considering offering one as a gift or simply treating yourself, we encourage you to stop by! Our medical spa has served clients all over Prince Frederick, La Plata, and the surrounding Maryland areas. If you want to book a treatment or ask us any questions about what we do, contact us today!